Yesterday, Disney released their upcoming slate of films which included more than twenty films through 2023. Among the news there are seven Pixar films — some we knew about, some shifted dates, and others are new dates altogether. Let's recap based on what we previously knew and what was announced yesterday. Untitled Pixar Film — March 6, 2020 (this film was previously slated for March 13, 2020) - Updated Dec 12, 2018 - it has been announced that this film will be titled, Onward. Now, that leaves a few other Untitled films and their dates in question. In 2016, Pixar announced that they would have two films in 2020 (one on March 13 and one on June 19). At the time of the aforementioned announcement, they also noted that they had two additional films beyond 2020 that are "highly likely", and if the release schedule stays on-track it appears we will have one film in 2021 and two in 2022. That being said, what could these films be? We already know that Dan Scanlon is working on a film that takes us into a suburban fantasy world. An excerpt from our 2017 D23 Expo post is below for a background on this film. Additionally, Pete Docter and Mark Andrews were also noted as working on original films, but the themes or plots of those films are unknown at this time. Be sure to visit the Pixar Post Forum to chat about all the Upcoming Films with other Pixar fans. Updated - When we originally posted this article, we had noted there were only 5 upcoming releases, we have since updated this article with additional details (and ultimately, 7 films). 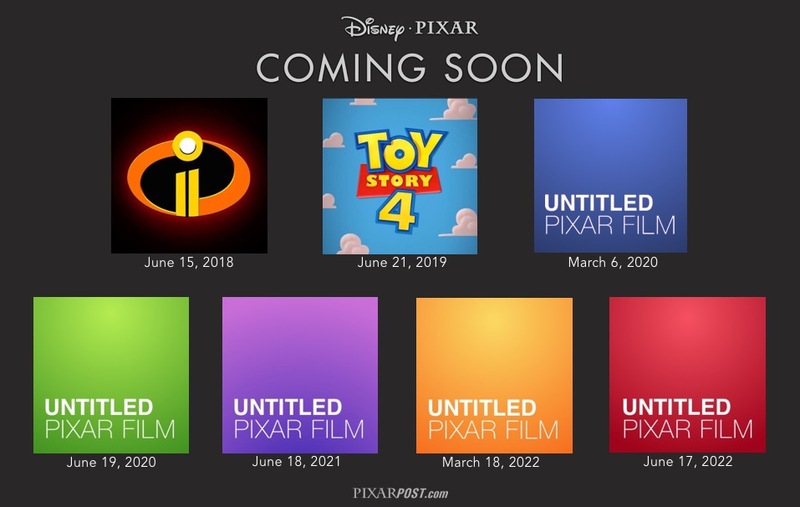 Disney releases dates for Pixar's next 5 films through 2022.